The beautiful town of L'Aquila in Italy has been struck by a major earthquake. At least 150 people have been killed and it is believed between 3,000 and 10,000 buildings have been damaged. 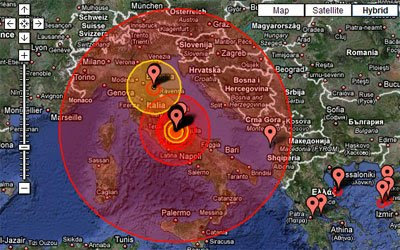 The 6.3-magnitude earthquake struck at 3.30am (1.30 GMT) close to L'Aquila city, 95km (60 miles) north-east of Rome. The Piazza del Palazzo in Google Street View. Amazingly the medieval bell tower of the town hall (pictured) has survived the earhtquake. L'Aquila is laid out within medieval walls and many of the town's buildings are very old and therefore not built to withstand a strong earthquake. UK newspaper The Telegraph are linking to this My Map of the area. The map currently plots recent news about the earthquake in the area around L'Aquila. Hopefully they will be adding to the map throughout the day. At the moment CNN are just showing a screenshot captured from Google Earth, showing a satellite image of the area with an overlay of the earthquake's epicentre. This Google Map plots data from the US Geological Survey. A coloured polygon is drawn to represent the size of each tremor. The screenshot at the top of this post was taken from this map.